When two of golf's most-renowned wedge masters get together, great things things tend to happen. The new Callaway PM Grind 2019 is a product of such a collaboration. Phil Mickelson, one of the all-time great wedge players, has teamed up with Roger Cleveland, one of the all-time great wedge designers, to make improvements to the PM Grind 2019 wedges that promise to allow golfers to hit wedge shots they never could before. 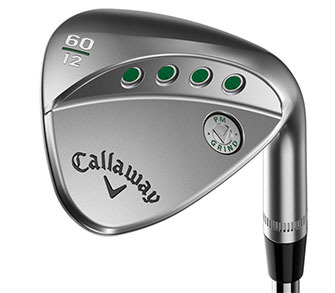 For Mickelson, the latest effort is a continuation of the special relationship he has had with Callaway wedges since back in 2014, when Callaway designed a prototype PM Grind just for him. The prototype was a true original -- it had a uniquely-shaped head with an expansive face area, grooves covering the entire face, and an exceptionally high toe that all allowed Phil to hit his famous high flop shots around the green. The next year, Callaway introduced the PM Grind wedge to the public and it has taken off ever since. Mickelson and Cleveland worked together to refine the PM Grind into a wedge that will help players hit all three of these shots. Mickelson tweaked the Groove-in-Groove technology in which micro-grooves are machined into the flat parts of the face, creating more points of contact with the ball and, consequently, more spin. He wanted those micro-grooves at a particular angle to optimize spin when the wedge face is opened for slop shots. Knowing that keeping your hands ahead of the ball is essential for hitting effective knockdown shots, Mickelson and Cleveland increased the amount of offset between the front edge of the hosel and the leading edge of the clubface. They then raised the toe, taking weight out of the bottom of the club, to pull the center of gravity upward and promoting a lower trajectory. Finally, they implemented a C-Grind sole, with increased relief on both the heel and the toe, which should improve contact from just about any lie. Positioning the micro-grooves on a 20º angle in relation to the standard grooves promotes added spin on chips, pitches and lobs. Generous relief at the heel and toe promote crisp, clean contact from a variety of greenside lies. 54º/14º, 56º/14º, 58º/12º, 60º/12º and 64º/10º. All available in righthanded and left-handed. 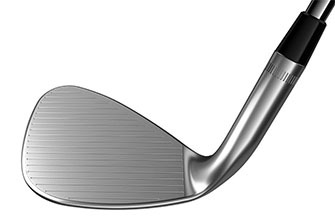 Tour-proven KBS Hi-Rev 2.0 steel wedge shaft designed to deliver and optimum balance of feel, spin and control. Tour-proven Lamkin UTX grip in black with green highlights. Platinum Chrome and the new Tour Grey, each with the circular PM Grind medallion on the back. The PM Grind 2019 wedges will be available to the public on February 15, 2019. Each will retail at a price of $159.99.